Protect your windows with the Mopar® Soft window storage bag. Available in Black Vinyl with Jeep logo. Stores Quarter and rear soft windows. 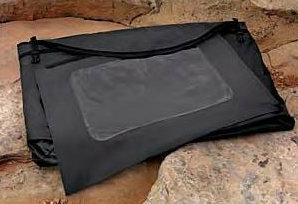 4 DR Soft window storage bag. Black Vinyl with Jeep logo. Stores Quarter and rear soft windows. Requires rear window to be be folded in order to fit.